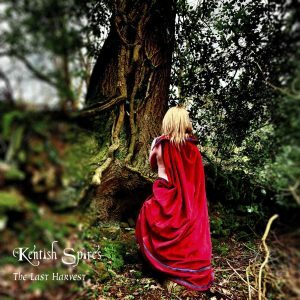 RockUnitedReviews: The KENTISH SPIRES - "The Last Harvest"
Blimey! Canterbury calling - It's The Kentish Spires and their offering to the Gods of early seventies Prog-Rock. Seriously. In the year of 2018, it's nearly impossible to find a new group of musicians with such a rich tapestry of British/English sounds and styles. Everything from the excellent production by guitarist Danny Chang (award winning composer/producer in the field of musical scores and songs for film and television) via all that brass and woodwinds to the wonderful diction and pronunciation of singer Lucie V (former frontwoman at Thunderstick - Samson/Iron Maiden), reek of Folk and Prog-Rock which made the Canterbury scene THE place to be in the early 70s. At least that's what I'm told. Canterbury was probably never the place "to be" since people tend to go slightly bonkers when it's all about nostalgia. Pretty much like Woodstock, it was probably just a field full of mud, shite, and acid tripping hippies. Unless you're into the Canterbury Cathedral of course, the Mother Church of the worldwide Anglican Communion and seat of the Archbishop. But I digress. This is an impressive debut album and you can instantly pick up various bits and pieces of acts such as Camel, Caravan, Gentle Giant, King Crimson, Soft Machine and Van Der Graaf Generator. Indeed. The full music spectrum with all the old prog instruments including several different saxophones, flute, clarinet, hammond, and of course the mellotron. We must never forget the mellotron. What would we be without the mellotron? It's a celebration of classic prog, but also the old harvest festival, and going back to the place where it all started. Danny Chang wanted to evoke the feeling of the more simple way of living that he experienced as a child in Kent in the early 60's. Actually. The title track is the great epic apocalyptic tale about the very last harvest before earth refuses to grow any more food. Lucie V, not your typical Goth/Siren influenced singer as of lately. She's got 'soul' and the distinctive warm voice that will gladly take you on a trip around the moon and back again. The band decided to compose several tracks about Kent and its ancient history. It's however not a concept, it's an album of many hues and textures, the title track alone proves that the Kentish Spires are anything but one trick ponies. Final verdict: Old school. Old sound. Old dogs (with the exception of Lucie of course). Old tricks. New favourites.